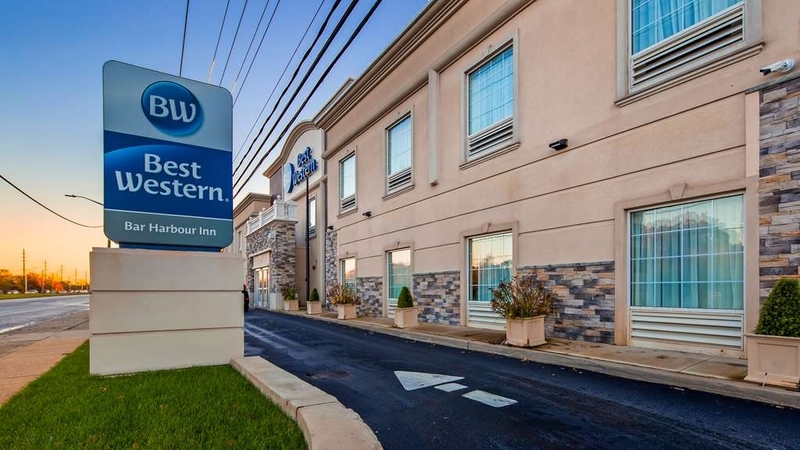 Das Best Western Bar Harbour Inn ist ideal in Massapequa Park Stadtzentrum zu finden. Erleben Sie ein schöner Aufenthalt in der Nähe von alle Sehenswurdigkeiten. Bestpreisgarantie und exklusive Angebote. Entspannung und Unterhaltung sind reichlich vorhanden in der Nähe unseres Hotels in Massapequa Park, zum Beispiel ein Abend im Nikon Theater im Jones Beach State Park. Vom Golfplatz des Bethpage State Park bis hin zum Robert Moses State Park auf Fire Island, hier ist für jeden Gast etwas dabei. Besuchen Sie ein NHL-Hockeyspiel oder ein Konzert im Nassau Veterans Memorial Coliseum, oder verbringen Sie den Tag einfach an nahe gelegenen Stränden als perfekten Einstieg in einen Familienurlaub. Das Pferderennen „Belmont Stakes“ auf der Rennbahn Belmont Park in Elmont bietet spannende Unterhaltung für Jung und Alt. 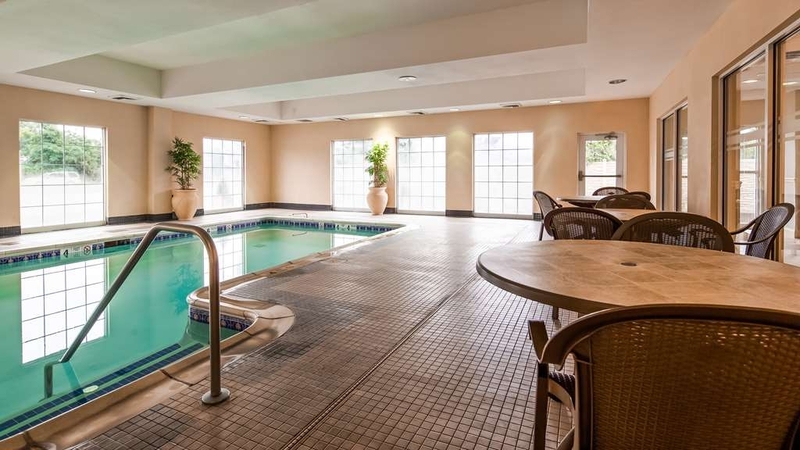 Zu den Annehmlichkeiten unseres Hotels in Massapequa Park zählen ein beheiztes Hallenbad und ein 24-Stunden-Fitnessstudio. Unser Haus ist das Hotel, das dem Jones Beach State Park und dem Nikon Theater am nächsten liegt. Da acht verschiedene Festsäle und Catering-Anbieter im Umkreis von 8 km liegen, wird unser Hotel gern für Hochzeitsgesellschaften gebucht. Einige der beliebtesten Festsäle sind Coral House, Venetian Yacht Club, Chateau La Mer, Manor East, Stuart Thomas Manor und The Riviera. Ganz gleich, ob Sie aus besonderem Anlass bei uns weilen oder einen Kurzurlaub planen, unser kostenloses Frühstück sorgt für einen guten Start in den Tag. Wir servieren jeden Morgen Waffeln, Obst und Gebäckstücke, Müsli und Cornflakes, Joghurt sowie reinen Arabica-Kaffee. Geschäftsreisende entscheiden sich oft für unser Hotel in Massapequa Park dank seiner günstigen Lage und der erschwinglichen Ausstattungsvielfalt. Stammgäste sind im Einkaufszentrum Westfield Sunrise Mall tätig, das gerade modernisiert wird, oder auch bei Walmart® und South Shore Mall. Für zahlreiche Bauunternehmer sind wir ein zweites Zuhause. Im Nikon Theater finden im Sommer jeden Abend Konzerte statt, während „The Black Course“ bei Golfern beliebt ist. Hier werden gelegentlich auch die US Open ausgetragen. Alle bedeutenden New Yorker Flughäfen sind 40 bis 64 km von unserem Hotel in Massapequa entfernt, sodass Anschlussflüge leicht zu erreichen sind. Buchen Sie ein geräumiges Zimmer im Best Western Bar Harbour Inn, und genießen Sie einen erholsamen Aufenthalt! "Fine for a long weekend visiting family in Amityville"
Room was clean and comfortable; location convenient. Check in was effiicient. Price reasonable. There are few hotels in the Amityville area and we were happy to find this one. We would stay at this hotel again. Dear Timothy, On behalf of the staff and management, we would like to thank you for taking the time to review our hotel. We are glad to hear that you found the room clean and comfortable. Our staff strive to provide an exceptional hospitality experience for every guest! Thank you for staying with us and we look forward to welcoming you back soon! I reserved a number of rooms for family members traveling to the area for a family event. To start, the rooms were not located near each other even though I made the reservations over a month in advance — but others checking after us were offered by the staff to get their rooms together. When I got into my first room, it was extremely noisy from the road out front (this is a MOTEL configuration, not stated when making the reservation) and the drawers in the dresser would not stay closed. We requested another room on the other side of the building trying to avoid more road noise and the desk clerk (she was late arriving for her shift and seemed lacking in knowledge about how to move a room) just gave us a room a few doors down from the original one. The second room was a bit quieter, but the floor was so uneven that you could easily twist an ankle - dips, holes, etc. For $150/nt plus taxes, you would think they could take better care of the place. The only positive items were some of the staff. The woman who takes care of the breakfast items was superior in attitude and service. Some of the desk staff were very pleasant and accommodating, but there is a lot of variability in that area. Dear Valued Guest, On behalf of the staff and management, we would like to thank you for taking the time to review our hotel. Our hotel has a unique configuration with 51 exterior rooms and 21 interior suites. I would like to take this opportunity and apologize that your stay with us was less than satisfactory. We value the feedback from every guest in order to create an exceptional hospitality experience. We have discussed this review with our maintenance team. We are glad to hear that our staff was kind and courteous. Again, thank you for such an in depth review. Should you find yourself in the area again, do give us a second chance to exceed your expectations. "Always a great stay even for one day!" Best hotel east of NYC. They make check in and check out enjoyable. You'll never want for anything your entire stay . And your privacy is always a major priority. The kindness shown by every member of the team headed by a gentleman named Brian is in matchable . On behalf of the staff and management at Best Western Bar Harbour Inn, we would like to thank you for taking the time to review our hotel and for the kind 5-star review. Brian along with the rest of our dedicated staff strive to provide an exceptional hospitality experience to every guest. We are glad to hear that your stay with us was an exceptional one! We look forward to welcoming you back soon. Check out the picture. Housekeeping or management had to have seen this in the room and said "this seems acceptable." Besides hole in the wall this room had weird smell to it. Just felt dirty everywhere. If it had not have been so late mintue, would have never stayed here. DO NOT Reccomend! Expected better from you Best Western. Dear Valued Guest, On behalf of the staff and management, we would like to thank you for taking the time to review our hotel. Upon review of the photo, it is clear that you were assigned a room that was out or order. Under any circumstances would we condone our staff to rent a room in poor condition to any guest. I would like to take this time and sincerely apologize that you were assigned the incorrect room. All guests are welcome to voice their concern to the front desk at any time during their stay. Our dedicated team strive to provide an exceptional hospitality experience for every guest. Again, I deeply apologize about your recent stay with us. Should you find yourself in the area again, do give us a second chance to exceed your expectations. Stayed 4 nights to visit my son who was having medical issues. The staff especially the front desk , were always kind & so helpful with our needs & concerns. The dining room staff worked diligently to keep the breakfast area with food replacement, & a friendly clean area. The location was perfect for us, & was close to nearby shopping & restaurants & major highways were easily accessible. Our accommodations were clean & comfortable as was the rest of the hotel ( a huge plus . ) We had an interior room which I will request again on a return visit & recommend for convience sake. The parking lot was well lite & with ample free parking. Again, I must forward a big thank to all of the staff at this property that made our stay so pleasant as we endured some difficult personal issues. I continue to appreciate them . Best hotel in the area ! Dear Valued Guest, On behalf of the staff and management at Best Western Bar Harbour Inn, we would like to thank you for taking the time to write such a nice review about our hotel. Our dedicated staff strive to provide an exceptional hospitality experience for every guest. Our hotel is minutes away from numerous area attractions that Long Island has to offer. We thank you for being our guest and are glad to hear that your stay with us was an exceptional one! We look forward welcoming you back to your home away from home in the near future. Dear Valued Guest, On behalf of the staff and management at Best Western Bar Harbour Inn, we would like to thank you for taking the time to review our hotel. I would like to take this opportunity and sincerely apologize about the construction noise that you heard nearby your room. Our hotel is in the process of a renovation. Our goal is to provide an exceptional hospitality experience for every guest. Your feedback is important to the hotel's success and it is greatly appreciated. Again ,we apologize that your stay at our hotel was less than satisfactory. Should you find yourself in the area, do give us a second chance to exceed your expectations. I have stayed at several BH before and was glad all I had to do was sleep here. It is old and it appeared that the rooms had never been updated. From the minute we walked in, I hesitated touching things. The bathroom lighting was terrible. The light fixture gave very little light so you could hardly see yourself at all. Location was close to where we needed to go. On behalf of the staff and management, we would like to thank you for taking the time to review our hotel. Our hotel is conveniently located to many exciting area attractions that Long Island has to offer. I am sorry to hear that you were dissatisfied with your stay. 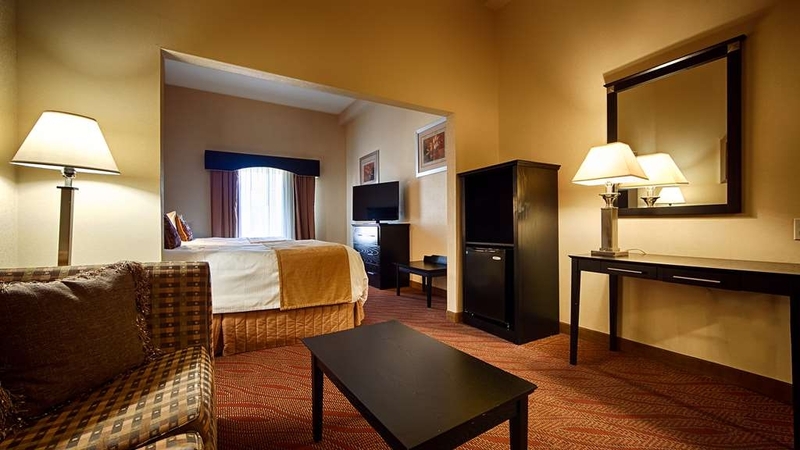 Should you find yourself in the area again, we would be more than happy to show you one of our spacious suites. Your feedback is important to the hotel's success. It is to our hope that you give us a second chance to exceed your expectations. 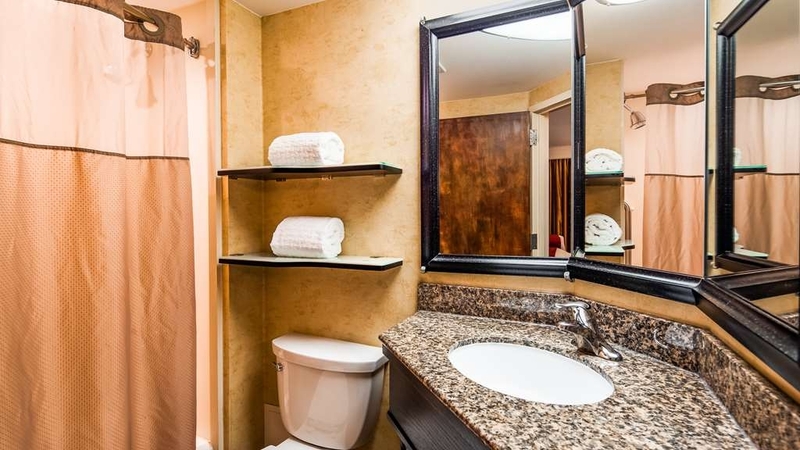 Clean, comfortable, and reasonably priced rooms. Excellent staff! Nice restaurants around to eat at and most will deliver to your room. Great selection for breakfast and I look forward to my stay there next month. On behalf of the staff and management, we would like to thank you for taking the time to review our hotel. We are glad to hear that you had an enjoyable stay. Our staff strive to provide an exceptional hospitality experience for every guest. Thank you again for your feedback. We look forward to welcoming you back soon. "Room stuffy and smelled of smoke"
I walked into my room and could smell that somebody had been smoking - even though the woman at the front desk assured me that all rooms were non-smoking. I turned on the AC to rid the room of the smoke and moldy smells but it was barely blowing cool air.. The woman at the front desk that first evening was accommodating - she came up to my room, reset the AC and agreed about the stuffiness and that the AC wasn't working. The tech came in Sat. morning but when I arrived back at my room Sat night - it still was not right. He looked at it again and assured me it was fine. The unit obviously isn't big enough to cool down a large room. Also, the smokers congregating outside the reception area made a nice hotel look tacky. Other than that, the desk staff was very pleasant, room was clean, breakfast was great and the hotel was convenient. Hopefully, they can remedy the moldy and smoky smells in the rooms which seems to be a problem. Everything was great with one exception. I had called prior to booking and specifically asked if the Wi-Fi connected through a website/domain (to agree to terms and such) and the rep said no. I had even explained that I have a game console I want to connect to stream; the rep stated I should have no problem. I was lied to. If you're a service rep and you don't know the answer just say so. Dear Valued Guest, Thank you for taking the time to review our hotel. I am sorry to hear that you were not completely satisfied with our wireless internet connectivity. Our wireless servers are designed for fast connectivity through any device including game consoles. Our front desk team is available at anytime to assist should there be any issue. Should you find yourself in the area again, do give us a second chance to exceed your expectations. We didn't even stay once we walked into the room. We had no idea there were smoking rooms. And we got one. The room had cracked tiles in the bathroom and was dirty. We walked out and booked at another place. Dear Laurene, Thank you for taking the time to review our hotel. Unfortunately, when you made the reservation with your travel agent, it defaulted to a smoking room. We are sorry to hear that you made a reservation for a smoking room. We appreciate your feedback. Should you find yourself in the area, please call the hotel directly to confirm your reservation. We look forward to welcoming you back soon. Ask for a room away from the highway. limited seating for breakfast. Good value at $100 average value at $150.. Picked it for location to wedding at The Riviera and running at the Massepequa Preserve. Dear Valued Guest, Thank you for taking the time to review our hotel. Our hotel is conveniently located to many exciting area attractions that Long Island has to offer. We are in close proximity to scenic Massapequa Preserve. I am sorry to hear that you were not completely satisfied with our complimentary breakfast. Our hotel has just finished rejuvenating the breakfast area with brand new seating. Your feedback is important to the hotel's success. Should you find yourself in the area again, do give us a second chance to exceed your expectations. "Such a wonderful experience !" The property was so modern and our stay was so pleasant! We recommend this place! Our family will be coming back! 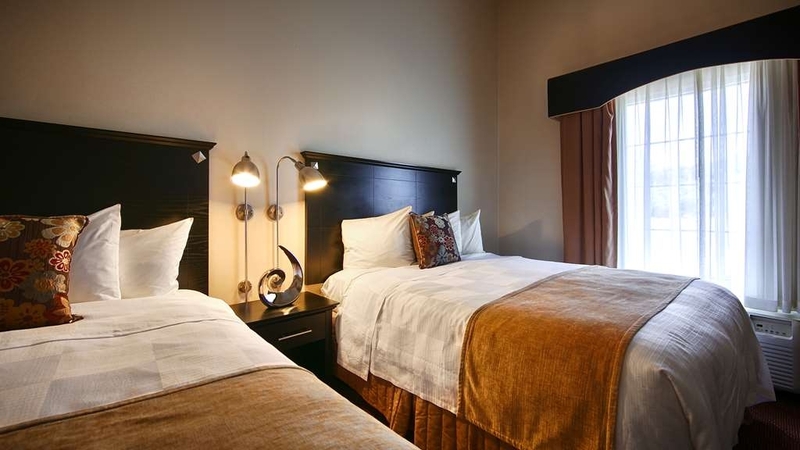 The room was clean, the atmosphere was very friendly and we we're very comfortable. Try this place out! On behalf of the staff and management at Best Western Bar Harbour Inn, we would like to thank you for taking the time to review our hotel. We are pleased to hear that you had such a wonderful stay. Our staff team pride themselves in providing every guest with exceptional service. We are glad to hear that you found your room to be clean. Thank you for the kind recommendation! We look forward to welcoming you back in the near future. There are not many choices in the area, so I booked here. I had a single queen room. It was very, very moldy; it was very dark; the drawers to the dresser did not close; the pillows were so lumpy I had to go buy new ones; the bed was lumpy and the room was very small. All in all the worst hotel I have ever stayed in. I did peek into some of the larger rooms and they appeared more pleasant. Dear Deannanel, Thank you for taking the time to review our hotel. I would like to take this opportunity and sincerely apologize that you were dissatisfied with your stay. I have addressed this issue with our dedicated maintenance team. Should you find yourself in the area again, we would be more than happy to show you one of spacious suites. Once again, we sincerely apologize that you were not completely satisfied. I would like to follow-up with you with regards to this issue. I look forward in speaking with you. "Solid choice for the area"
My husband and his family stayed here the night before our wedding since they were traveling from out of town. It's pretty much what you'd expect. It was a bit overpriced for what you get, but it did the trick for their needs. The rooms were fine, the breakfast was satisfactory, it was clean, but nothing fancy. There were no issues and nothing wrong, but the fact that it's the only real place to stay in Massapequa allows them to charge more than they should. Dear Laura, Thank you for taking the time to review our hotel and for choosing us for your wedding celebration. We are glad to hear that you had an enjoyable experience. Should you find yourself in the area again, we look forward to welcoming you back in the near future. Dear Michael, On behalf of the staff and management at Best Western Bar Harbour Inn, we would like to thank you for taking the time to review our hotel. I would like to take this time and sincerely apologize that you experienced an odor in your room. I have addressed your issue with our maintenance team. Should you find yourself in the area again, do give us a second chance to make your next stay with us an exceptional one. We stayed here overnight to attend a concert nearby. Hotel is conveniently located about 15 minutes from the venue. The staff was wonderful- very accommodating, courteous, and attentive. The room itself was spotless, spacious, and the bed was very comfortable. However, the only negative thing I have to say is that there was a heavy musty smell. This was concerning, as I have respiratory issues. I would return in the future if management addresses this issue and rectifies the problem. Dear Martha, On behalf of the staff and management at Best Western Bar Harbour Inn, we would like to thank you for taking the time to review our hotel. We are glad to hear that you found our staff to be professional and the room to be spotless. I would like to take this time and apologize that you experienced a musty smell in your room. I have addressed this issue with my maintenance team. Should you find yourself in the area again, do give us a second chance to make your next stay an exceptional one. Came for a funeral nearby. Musty smelling rooms, HVAC either too cold or too hot at night, came home with 8 bites from the night's sleep-either mosquitos or spiders. Cigarette butts on the outer corridors outside of some of the non-smoking rooms. On behalf of the staff and management at Best Western Bar Harbour Inn, we would like to thank you for taking the time to review our hotel. I would like to take this time and deeply apologize about your most recent stay. We value your feedback. I would like to discuss this issue in greater detail. It is to my hope that should you find yourself in the area again that you give us a second chance to make your next stay with us an exceptional one. Just stayed there August 2018. Given an outside room because I walk with a cane. Room was very damp and humid. The bathroom door can't close shut because the door is swollen from the humidity in the room. No grab bar in the bath tub, not good if you are handicapped. Health hazard because of the dampness, sheets and towel were damp, the notepad was damp. Told that the problem was that it was an outside room and the hotel is a mile away from the water. I lived on the water in Seaford and never had this problem in my home. Staff was polite and there was nothing that they can do and were aware of the issue. Nothing could dry in the room and mold must be building up. Shut down the outside rooms and add grab bars in the bath tub. Best Western should inspect this property and force a clean up of this health hazard. On behalf of the staff and management at Best Western Bar Harbour Inn, we would like to thank you for taking the time to review our hotel. I would like to take this opportunity and sincerely apologize about your most recent stay at our hotel. Your feedback is important to the hotel's success. Due to our close proximity to the water, some of our exterior rooms experience humidity. I have addressed your issue with our maintenance/engineering team. Once again we sincerely apologize that you were not completely satisfied during your stay. Should you find yourself in the area again, we look forward to welcoming you back. Stayed here when we had our hard wood floors done. Very clean and the rooms were spotless. The staff on hand are extremely friendly and offer any information needed. I recommend this to all. I would go back here anytime. On behalf of the staff and management at Best Western Bar Harbour Inn, we would like to thank you for taking the time to review our hotel. We are glad to hear that you found our rooms clean and the staff to friendly. We thank you for your kind recommendation and look forward to welcoming you back in the near future! Nice place and fairly close to Jones Beach. About a 10-15 minute drive from Jones Beach. We were seeing a concert at Jones Beach theater and stayed at this Best Western. Breakfast area was small and not a lot of seating. Had to take my breakfast back to my room to eat. On behalf of the staff and management at Best Western Bar Harbour Inn, we would like to thank you for taking the time to review our hotel. Our hotel is in close proximity to many exciting area attractions including Northwell Health at Jones Beach Theater. We deeply apologize that you were dissatisfied with our breakfast accommodations. Our hotel is currently in the process of revamping the area to create an improved breakfast experience. We thank you again for your review and appreciate your feedback, We look forward to welcoming you back, should you find yourself in the area again. We found ourselves on LI without a place to stay on a last minute trip to the beach. Contacted Best Western after seeing the hotel on Trip Advisor. They had one room left that would meet our needs. Called and spoke with Kathie. She was great! Held the room for us, checked us in quickly, and was very helpful. The room was clean, beds comfortable, and staff friendly. The hotel is on a Main road. It's directly across the street from Long Island RR station. Plenty of places to eat and shop nearby. We went to Fire Island to Robert Moses State Park, which was about a 10 minute drive. Very happy with the hotel. "Great Place to Stay for Jones Beach Concert"
We recently stayed at this hotel when attending a Dave Matthews Band concert at Jones Beach. This is the second time staying at the hotel. The front desk staff is always extremely friendly. When we checked in, they had us in a room on the second floor. We were tailgating at the show and had a lot of things in our car that we needed to take into the room overnight, so I asked if they could move us to a first floor room on the outside, so we could just back our car up to the door. They were very willing to accommodate our request. The rooms are decent and up to par with other Best Westerns. Nothing fancy, but a comfortable place to spend the night. The outside door to our room stuck a bit, and you had to push pretty hard to open it, but outside of that I have no complaints. The location is good. It is on a busy highway. It's a bit of a challenge to get out of the driveway, and if you want to go left, you have to turn right and make a U-turn at the next light. There are a couple of late night diners on the same road, which is great when you are attending a concert and want a bite to eat after the show. The hotel is right across the street form the train, so although we've never done it, it appears that it would be easy to access the train and get around that way. On behalf of the staff and management at Best Western Bar Harbour Inn, we would like to thank you for taking the time to review our hotel. In addition, we would also like to thank you for your ongoing loyalty with our hotel. 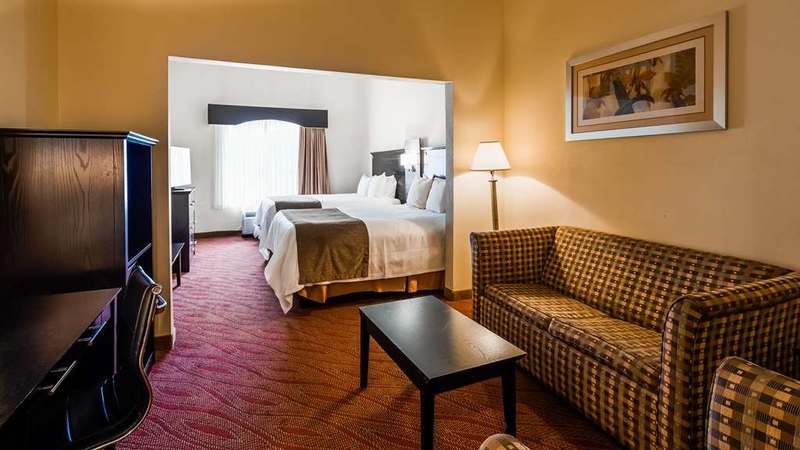 Our hotel is conveniently located nearby various exciting area attractions and other points of interest. We thank you again for your feedback and look forward to welcoming you back to your home away from home in the distant future. I had numerous problems beginning at check in. I booked a two-queen bed suite, non-smoking many months in advance. When I arrived, I was told I was in a smoking room, which was unacceptable. I reminded them that I was a Diamond Select member and didn't appreciate the treatment I was receiving. The best they could do was put me in a queen room with a pullout sofa. The room had a huge wine stain where someone must have thrown a glass against the wall and there were numerous bugs. I complained and was told that there were no other rooms to move to. It was only a two day stay so we dealt with it. My wife took a shower only to realize the hair dryer didn't work. The next night, the remote control didn't work. On each occasion, I informed the front desk that I wanted to speak to the manager. They left notes each time and said the manager would get back to me and make things right. She never did. I enquired again and the front desk hand-wrote a note requesting the manager provide a number of points to my account and again, I have never heard from the manager, nor received any points. I did return for another stay and fought to be placed in a different room and inspect it before checking in. The second room/stay was a completely different experience than the first. Much better. Dear Frank, On behalf of the staff and management at Best Western Bar Harbour Inn, we would like to thank you for taking the time to review our hotel. I would like to take this opportunity and thank you for being a Diamond Select Member with our chain. We deeply apologize about your negative experience. I have addressed your issues with our housekeeping team. Your feedback is important to the hotel's success and it is greatly appreciated. We are glad to hear that you gave our hotel a second chance and that you had better experience. Again, we thank you again for your continued loyalty with our brand and we look forward to welcoming you back soon. 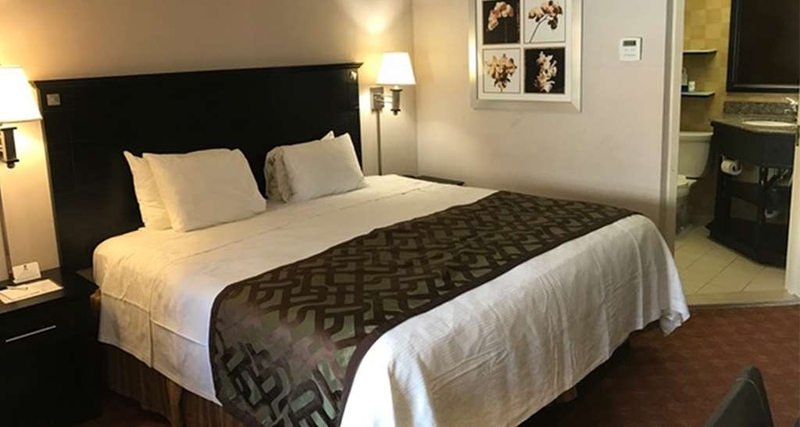 This hotel is right in the middle of town, close to the train if you need it, comfortable beds, clean rooms, free wifi and breakfast with plenty of parking. The reasons I did not give this an excellent rating are there are no elevators so if you are on the second floor you have to lug your bags up the stairs. Also I went to the front desk to get change for a $100 bill and was told they did not give change which I had never had a hotel tell me. Dear Rebecca, On behalf of the staff and management, we would like to thank you for taking the time to review our hotel. 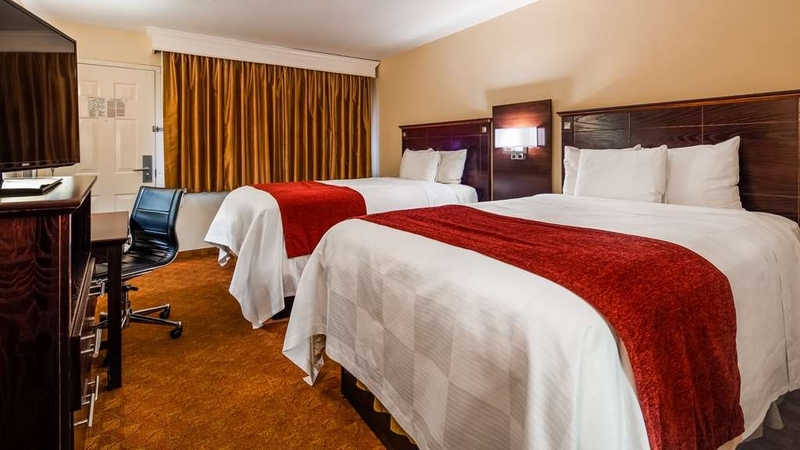 We are glad to hear that you found our hotel clean, comfortable, and close to area attractions. Unfortunately, our elevator is located in our new building. We deeply apologize that we were unable to fulfill your request during your stay. Should you find yourself in the area again, do give us a second chance to completely exceed your expectations. Nice place to stay and use MTA. Cheap way to see most everything on the Island. We went to a couple of local restaurants and had some great lobster rolls. Enjoyed the US Open while on the island. There local transportation rail is good to get to where you want. We took it into Manhattan and Long Beach. Dear Guest, On behalf of the staff and management at Best Western Bar Harbour Inn, we would like to thank you for taking the time to review our hotel. We are pleased to hear that you enjoyed the many restaurants that Long Island has to offer. In addition, our hotel is conveniently located 1/2 mile from the Massapequa Park Long Island Railroad station. Again, we thank you for your kind feedback and we look forward to welcoming you back to your home away from home soon! The BW is convenient to shops and restaurants. It is also located near (1/4 miles, more or less) the Massapequa Park Station of the Long Island Railroad (LIRR). For us, this was a pleasant surprise since we intended to make a couple of day trips to NYC as well. From Massapequa Park, it's a one hour ride to Penn Station. I highly recommend travelling to Penn Station during off-peak hours, you will save a little money and stand a chance at getting a seat. We spent 5-nights at the BW. The staff was friendly, helpful and knowledgeable about the area. The room was clean, comfortable and updated with a wall thermostat controlled AC. Breakfast was well prepared and presented. Coffee is available 24/7 in the eating area which I appreciate because I tend to run out of the pods in the room pretty quick. Cost was average. We enjoyed our stay. Would stay again. Dear Salvatore, On behalf of the staff and management at Best Western Bar Harbour Inn, we would like to thank you for taking the time to review our hotel and for the kind 5 star recommendation! We are pleased to hear that you enjoyed your stay. Our hotel is in close proximity to the Massapequa Park, Long Island Railroad train station and other nearby area attractions. Our staff take great pride in providing each guest exceptional service and kind hospitality. We look forward to welcoming you back in the near future.. I only spent one night, but everything went great. Friendly guy in reception, good breakfast and clean room. Good wifi. I would recommend to any of my friends. Not dog friendly though. If you have a pet, use BW Woodbury NY. Dear Candace, On behalf of the staff and management at Best Western Bar Harbour Inn, we would like to thank you for taking the time to review our hotel and for the kind 5 star recommendation! We are pleased to hear that you enjoyed your stay. We look forward to welcoming you back in the near future. The best part of this hotel is the staff. James was especially helpful when we had questions and concerns. The night clerk and the woman overseeing the breakfast area were friendly. The breakfast area was well-maintained and well-stocked. The hotel is conveniently located. It is close to the Wantagh Oyster Bay Expressway. Wantagh Parkway is also nearby, so access to Jones Beach is easy. You can walk to some restaurants including a Panera's, located in a small shopping center. The front of the hotel is newer, but the back rooms are from a long-ago motel. We stayed in the front several times and enjoyed the stays. This time, because we arrived on short notice, we had to take a room in the back. The rooms there are clean, but very small. We were on the first floor for one night. We heard every step of the people above and they didn't retire until after 1a.m. The hotel was very accommodating, and moved us to the second floor for the next two nights which was much better. The hotel is busy and gets some hard use. The outside of the windows and the stairwells are in need more attention. Dear Michael, Thank you for your continued loyalty with our hotel and for taking the time to write an in-depth review about your stay. James along with the rest of our staff take great pride in providing guest satisfaction. We sincerely apologize about your negative experience during your first night. I am glad to hear that our staff was able to accommodate you for the following night by moving your room. Once again, we thank you for your continued loyalty with our hotel and we look forward to hosting you again. My family and i stayed at this hotel for a week. We found both the staff and facilities to be excellent. The cost of the room was reasonable considering the location near NY City, If I need to be in this area again I will definitely stay here. "Newly remodeled property - nice!" Very friendly and helpful staff. Newly remodeled including the parking lot. New beds (a little too firm for me, but better than worn out!). Plenty of hot water with good pressure in shower. Would definitely stay here again. Only complaint would be lack of sound proofing between rooms and from outside. Not a problem for me as I sleep with ear buds and white noise. Dear Pam, Thank you for taking the time to review our hotel. We are pleased to hear that our staff was helpful and courteous throughout your stay. We look forward to welcoming you back soon! "Best hotel outside of Amityville. Not wonderful, but satisfactory"
My wife and me stayed here for 1 night. We were attending a concert at the Revolution Bar in Amityville, which was about a mile east of this hotel. So it was an easy drive back and forth. The hotel is off Sunset Hwy, which has many restaurants, shops, gas stations, etc.. The hotel is a bit dated. It a motel-style with free parking. Our room had a musty smell to it. We stayed in a non-smoking room. Whenever we put on the light in the bathroom, the exhaust fan turned on and on occasion, we smelled smoke from the other rooms. On the flip-side, the bed was comfortable, the room had plenty of storage, the rate was decent (under $ 150) and staff was very friendly. The hotel offered free continental breakfast, but we skipped to hit the road early. If our needs bring us back to this area, we would consider staying here again. Thank you for taking the time to review our hotel. 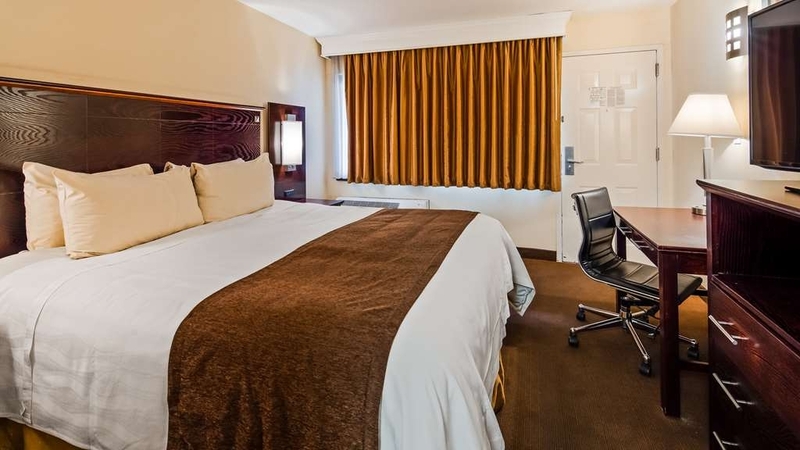 We are pleased to hear that you found our hotel convenient to nearby area attractions. We deeply apologize that you were not completely satisfied with your accommodation. Any odor that is present in a room is not acceptable to our hotel's standards of lodging. I have addressed the issue with my housekeeping team. We appreciate your future consideration with our hotel. We look forward to welcoming you back soon and making your next stay an exceptional one. Service was good, lobby was nice, breakfast was good. Room was a let down. It was a motel room in the parking lot, it was more like an $80 room not a $160 room like we paid. The carpets were smelly and filthy, my feet were black walking on it. Beds were clean but other than that the room needs a fresh coat of paint, a new carpet and a deep clean. On behalf of the staff and management at Best Western Bar Harbour Inn. We would like to thank you for taking the time to express your experience you had at our hotel. We deeply apologize that your experience was not a great one. Guest feedback is important to our hotel's success. The team and I strive to ensure that our guests have a flawless experience by offering them a clean, safe, and comfortable room while providing exceptional service. I am sorry to see that we have failed to exceed your expectations,. I've shared your experience with the team and assure you, we will use this as a stepping stone to learn from our mistakes and improve. Please feel free to contact me directly to discuss your stay in more detail and ensure your lasting impression of us is a pleasant one. "For the price it's ok, but not ideal "
Our big issue was there were several bigger parties in the hotel at the same time and some were clearly partying a bit too loudly and the smell of weed was prevalent all over. The front desk was nice about it, but The beds weren't very comfy, the towels weren't great, and the pool is ok, but small and in a room gets loud and it was very oddly cloudy in the pool. The free breakfast is nice enough, typical continental fare plus eggs and sausage, waffle machine, and cereal. It's right on the main road so easy to get to stuff nearby, so if you just need a cheap place to crash it does the trick. Thank you for taking the time to review our hotel. We apologize that you had a negative experience at our hotel and we did not exceed your expectations. I have addressed your issues with my team. Should you find yourself in the area again, do give us a second chance to make your next stay an exceptional one. Who makes an online reservation at 9pm for that night? You just show up, if you need a room right then and there. I was back and forth making a reservation at 2 hotels and the online page reverted to it's default date and I did not notice. As a result, I was charged for not showing up for that night's stay. The representative who handled my request for help, said that while the hotel would credit me for the night, the night that I need is not available, so, THEY GET TO KEEP MY MONEY. Who can afford that who is staying in a Best Western? Thank you for taking the time to review our hotel. We apologize we did not exceed your expectations. Your feedback is important to the hotel's success. I had spoke with you regarding this inquiry. The hotel refunded your credit card in lieu of your error in booking. Unfortunately, we did not have availability for your desired arrival date. Should you have any additional questions, feel free to contact us. at (516) 541-2000. Very nice room, good value, attentive staff. Good location. A little more expensive than others in the area but well worth the additional cost. Clean and well-appointed room. Tastefully decorated. Friendly staff. Dear Daniel, Thank you for taking the time to review our hotel. We are pleased to hear that you found our hotel to be convenient, the rooms to be well-appointed, and the staff to be kind and professional. Your feedback is important to the hotel's success. We look forward to welcoming you back should you find yourself in the area again. There are very few hotels in the Massapequa area, so when visiting family we oftentimes stay here. Nothing fancy, but good breakfast and friendly staff. The water is hot and there is good pressure in the showers. Dear Michelle, Thank you for taking the time to review our hotel. We are pleased to hear that you enjoyed our complementary breakfast and our courteous staff. Our staff take great pride in guest satisfaction. We look forward to welcoming you back should you find yourself in the area again. On the plus side: free internet and breakfast; convenient location; close to food and shopping; friendly staff On the negative side: small rooms; NOT clean especially the bathrooms; breakfast is great if you beat the staff to it; motel not hotel I am not a hotel snob but for the price and the lack of cleanliness I would not stay here again. Dear Amy, Thank you for taking the time to review our hotel. 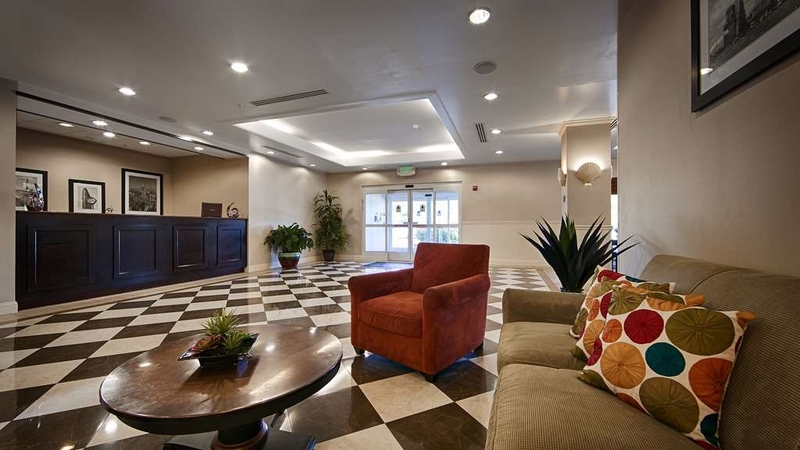 We are pleased to hear that you enjoyed our complimentary amenities, friendly staff, and shopping conveniences. We deeply apologize that you were unhappy about the cleanliness of your room. Breakfast is served daily from 7 to 10am, we allow our housekeeping team to take their lunch break after breakfast hours. We appreciate your feedback, I have discussed both your positive and negative experience with my team. We look forward to improving your next stay, should you give us a second chance. On behalf of the staff and management, we would like to thank you for staying with us at Best Western Bar Harbour Inn as well as your kind review of our property. We look forward to welcoming you back soon. "Always happy and comfortable when I'm here.....thanks Cathy!" I come to Long Island several times a year from Florida To visit family and friends. I always chooses the Best Western Bar Harbour Inn in Massapequa to stay. I travel alone but never feel alone when I am here... Behind the front desk is Cathy who always makes sure you feel welcome and that you will be comfortable. From making sure you like your room , you were happy with the buffet breakfast and offering her help any way she can. Today she faxed some important documents for me. Tonight, when it is snowing wildly and I was hesitant to go out, she offered to share her home made meatball sandwich with me! She also gave me some soup! She is always taking care of someone's concerns. The hotel also has a gym indoor pool and laundromat..and a secure happy feel to it. Thanks Cathy ,and the rest of the staff ,who work with smiles on their faces to keep their guests content. .
Dear Lori, On behalf of the staff and management, we would like to thank you for your kind review of our hotel. We are pleased to hear that your stay was a happy and comfortable one. Kathie as well as the rest of our team strive to provide exceptional service to every guest. Thank you for your ongoing loyalty and we look forward to welcoming you back home in the near future. "Staying here after our Daughter's Wedding." My wife and I are excited to be spending the night here with family & friends following our daughter's wedding. We had the pleasure to meet 'Kathie' who was kind enough to give us a tour of the different rooms avail and explained all the amenities Best Western had to offer. The rooms were large, exceptionally clean, and nicely furnished. 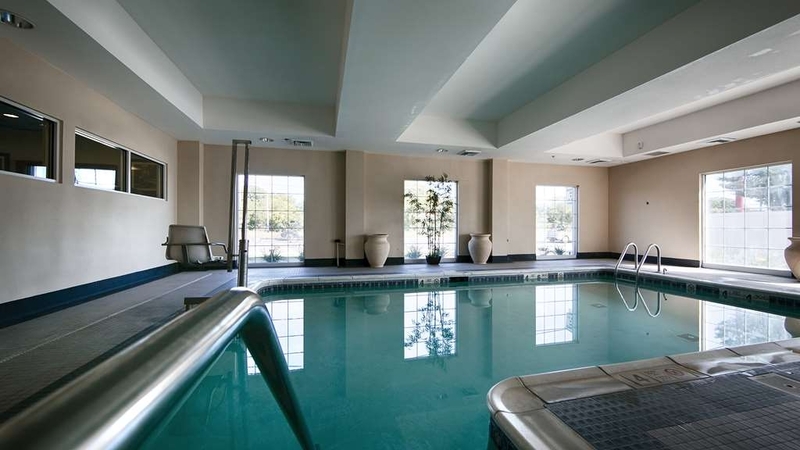 This coupled with free breakfast, an exercise room, and an indoor pool is sure to please, so we booked in total 10 rooms. Thank you for choosing our hotel for your wedding celebration. We are glad to hear that you enjoyed the elaborate tour of our property. Should you have any additional questions, feel free to contact us at (516) 541-2000. We look forward to hosting you. The staff makes this an easy place to stay. I have returned here year after year. From check-in, cleaning staff, breakfast..... they are helpful and friendly. I always ensure I tip them for making my stay EASY! "Bed Bugs in most rooms"
we stayed in the hotel for 12 days there was a16 of us and 6 fell sick ..ended up in hospital bedrooms were very humid and stunk there was bed bugs in the rooms we had to ask to get the rooms cleaned no room cleaning after 1pm ..... couldn't tell if reception staff or just loiters ..... no greetings when you walk in ..... DON"T STAY AT THIS HOTEL !!!!! "Really is “best “ western Service and locaatiiontion was as if not better then hotels twice as much"
"Best hotel on Long Island!!" Great hotel with excellent, professional, warm and caring staff!!! We have stayed here many times and it is always a pleasant experience from check in to check out! Rooms are clean! Breakfast is delicious! Perfect choice if you are visiting the SouthShore in Nassau County. Safe location with clean and comfortable rooms. A breakfast buffet is included in your rate and if you check around you will find that the rate is reasonable. I will stay again the next time I visit the area. "Great value for the money and super friendly staff." I stayed here over 10 years ago while visting nearby family, and the hotel room conditions were so deplorable, we barely made it through one night. I was hesitant to give them another try, when attending another function recently in the same area but I was encouraged by their complete makeover and hotel renovation not too long ago. I was overwhelmingly pleasantly surprised at how great the hotel and new rooms looked! What an amazing improvement from before! One suggestion I would make to the hotel, is to have someone do a quality control Check of the overall cleanliness of the room after servicing in preparation of the arrival of the next guest. Reason: not a show stopper, but I did find 2 different strands of someone else's hair on two of my 4 pillows, and a strand of hair on the shower bathtub. This something a quality control checker could have picked up. Otherwise the room and bathroom were immaculate. The location was very convenient and safe area. A few restaurants near by but did not visit any of them. Not to impressed with the breakfast. If your a non smoker make sure request a non smoking room. The web site I booked this room did not have that option. "Second stay in a year"
I visit my hometown NY every year and prefer best western for quality and convenience. The employees are caring and the desk staff always on duty. The breakfast has enough choices. The general bathrooms are extremely clean and well taken care of. This is my go to hotel for any NY visit. "Best Western Bar Harbor Massapequa Park"
The hotel is covvient to get to, located on sunrise hwy in Massapequa Park. The rooms are really nice and the beds are really comfortable. The staff is very helpful and friendly. They have a great breakfast, serving bagels, donuts, cereal, toast, waffles, 4 different types of juices, coffee and tea. Having to be to a very early meeting, I spent one night here for the convenience of the location to the meeting venue. I was pleasantly surprised to find a rather lovely room and bath. It was clean, fresh, and very comfortable. The ladies at the desk were very cordial. When they heard I would be leaving at 5 the next morning, they offered me a snack bag containing granola bars, an apple and a bottle of water. Nice touch. I've stayed at this Best Western 3 years in a row when needing to be on South Shore of Long Island. It's my favorite; excellent rooms, staff and awesome breakfast included. Great Italian restaurant next door too. Perfection! "Great location to Jones Beach"
Stayed at this hotel because I was going to a concert at Jones beach. The hotel was within 15 minutes away. The desk clerk at check in was very helpful and friendly. The room was very clean. Only downside was the bed was uncomfortable. It was a king size bed and we got 4 tiny pillows . There is a free breakfast but we did not have enough time to try it. "You Get A Lot Of Bang For Your Buck!" 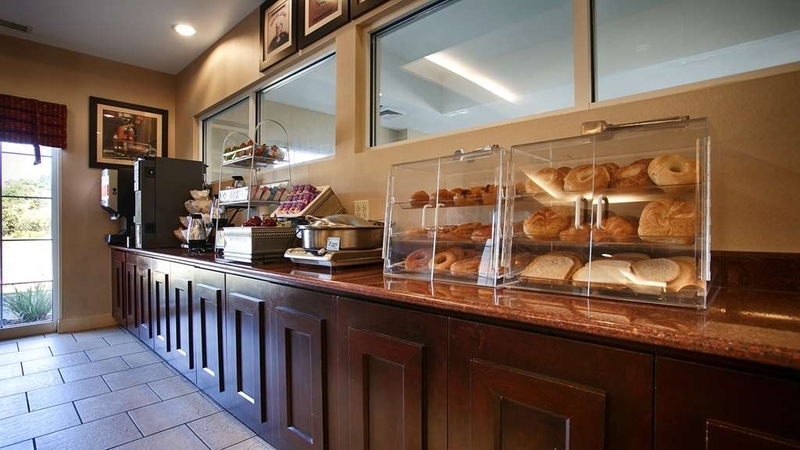 The complimentary breakfast is filled with different choices of very good tasting foods. The suite's refrigerator was a welcome addition. 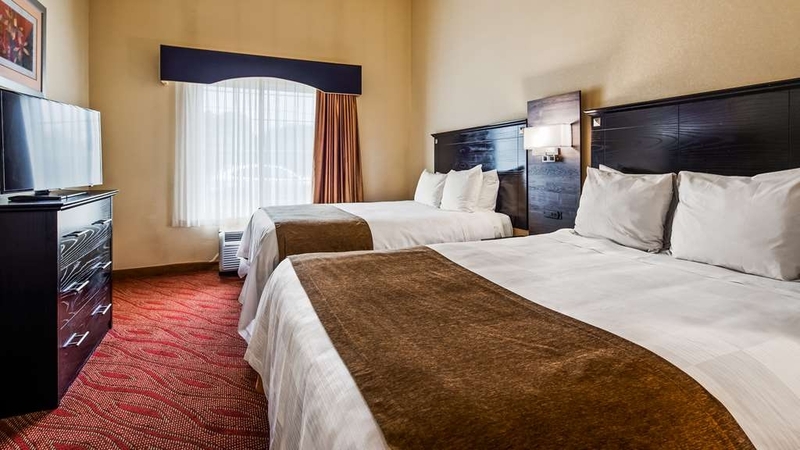 The beds are comfortable; the sheets are clean smelling; the hallway and reception areas shine; and for the most part, the staff is respectful, courteous, and caring. I highly recommend this hotel for one night or more. With the exception of a loud house keeper, and the bed being a bit hard, I always enjoy my time at this best western. It is located conveniently to shopping food and Long Island attractions as well as my family. "A nice stop on our road trip!" Very helpful front desk folks got us checked in. The rooms were recently updated so they were sparkling fresh. Nice to sleep on a new bed! The had a fire pit with seating which made for a quiet evening. We were very disappointed in our stay. There was a fire alarm at 5:10 AM on the second night of our stay due to the front desk clerk burning his toast. We were ushered out into the rain and when we returned he told us he had to call a few numbers to find the keys to turn the alarm off and it was because he had burned toast. No apology was given. Then to top it off there was no cleaning service for our room that day and we had to call twice for towels and to have someone remove the trash that we had cleaned up ourselves. On a good note, the front desk staff were helpful with maps of NYC for us. The Hotel, Room and Stay were all perfect. The Beds were extremely comfortable. The Best Noght Sleep I've had in a long time. Breakfast was also good. They had a selection of juice, coffee, tea, hot chocolate. In addition to fruits, pasteries, cearals, along with Waffles, Eggs and Sausages. The indoor was nice too and open until 10 PM. This place is a special place. Thank you for taking the time to review your stay with us! I am pleased to hear that your stay was a pleasant one. Our team strives in making sure each and every guest has an perfect stay. We hope to see you in the future. Came back to visit LI for a high school reunion. Service was excellent, locations n was difficult to get in and out of, room had a damp odor and did not seem to be healthy. I had to fix the shower head who sprayed all ver ceilings and walls but fixed easily. Not much f a choice in the area for hotels so not sure I would stay here again. This is a nice clean hotel in a good location with a friendly, helpful staff. I would recommend it to anyone looking for a medium priced hotel in this area. It is close to the LIRR station for trips into Manhattan and there are numerous restaurants within a 15 mile radius. Great service and room, very good and healthy breakfast, awesome coffee, 24/7. Rooms and bathroom very clean and very comfortable. Ease of getting in and out on a major highway, and very close to train, and airports. Right on Sunrise Highway, and very pleasant experience. Walking distance to food and shopping. I would definitely recommend this hotel. Check in/out was very easy. The hotel Staff was very helpful and pleasant. The Room was clean and comfortable. Overall very good experience in route be happy to stay here again. "Poor quality in carpets. Need to be cleaned and/or repaired." Rooms could use upgrade especially the worn carpets. Location is good, liked the idea of parking right by our room. Good access to room. Breakfast was adequate! Staff was polite & helpful when I needed a room change due to carpet tear. "one of the best hotels i stayed in"
Thank you for taking the time to review your stay with us. We are very please to hear that our hotel meets your standards, and that your stay was pleasant. We hope to see you again in the future. Conveniently located as we were here for the beach. The front desk staff were fabulous. They were very personable and answered all questions we had. Rooms were very clean and so was the hotel, We will definitely stay here our next trip up. "Good for anyone needing a room"
This place is clean and nice, not like a cheap sleazy motel. 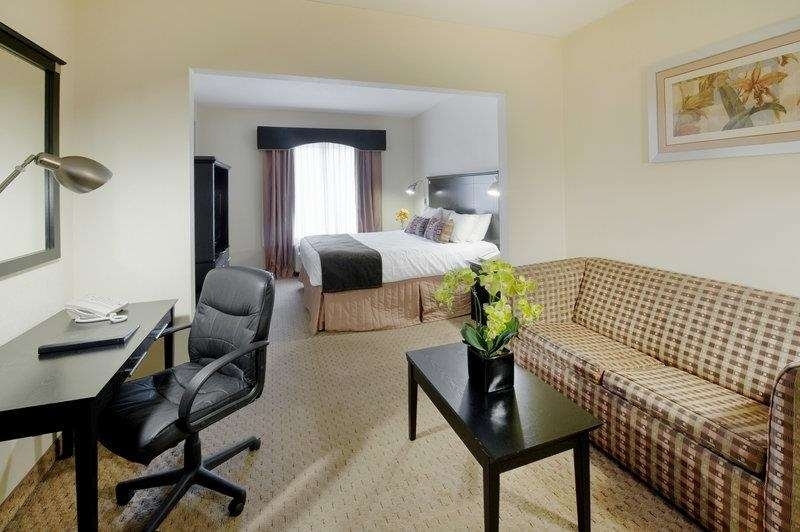 It has comfortable beds and it is conveniently located.Close to all the local shops and a mall across the street. Good food near by (within walking distance). Although it is located on a busy road, the rooms were quiet. 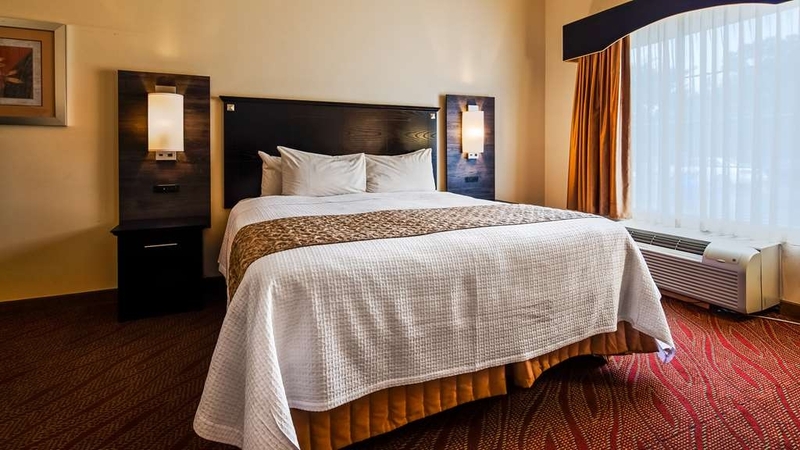 The hotel is conveniently located and provides ample free parking. The room was clean, the WiFi connection was excellent, the AC unit worked well, the breakfast was as expected, and coffee was available all day. Hotel was very convenient to my destination,which was Long Beach.Staff was great and met all my requests.Price was less than what I was expecting.Room and beds were very clean.Breakfast was good with all kind of choices. "Clean, efficient, nice breakfast "
I stayed here for a girls reunion visit. We had a queen deluxe suite for 4 and it was nice and roomy . Nothing super fancy , but clean, fridge , coffee maker, and always someone at the desk to assist. Continental breakfast was complimentary and nice . I would recommend staying here. This hotel was very clean and the amenities offered were exceptional. The staff is very helpful answering questions. The location was great for us as we were attending a family reunion/graduation party. They have an indoor pool and small fitness center as well as a small business center that was very helpful. The only drawback is the entrance to the hotel to check in is located in the back of the building which is alittle inconvenient. Both other than that, this is a great hotel. Very clean. Great breakfast friendly and accommodating staff. Good location. Beds were very comfortable. 5 minutes from Railroad Many shops like kohls, White Castle and a shopping mall and a great diner all nearby. One of the most comfortable hotels and caring staff. Anything needed was addressed immediately all recommendations were spot on. This will be my go to hotel when I am on a trip to this area. I have been to many of the so called higher end hotels in the area and they don't stand up the the caring staff this best western offers. Thank you for taking time to review your stay with us. Our staff here strives to make sure that each and every guest has a pleasant stay. 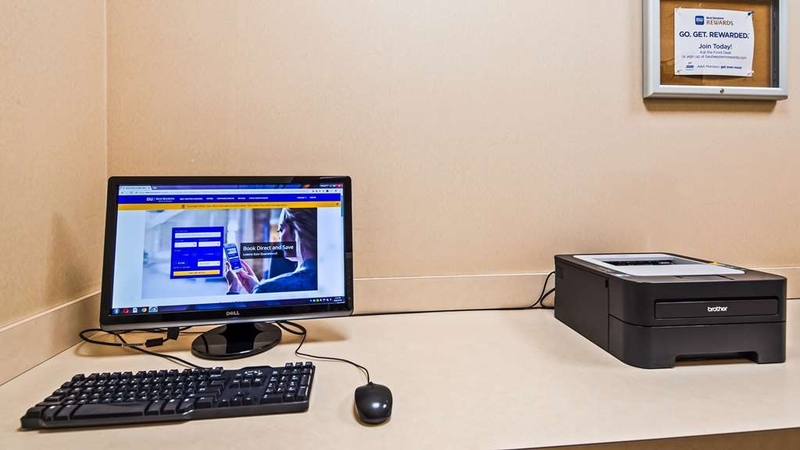 We take pride in making sure you enjoyed your time here at the Best Western with us. Hope to see you in the future. "Not for family's,young adults with a no care attitude are a better fit." The desk staff weren't welcoming to my children. This isn't a family style hotel. It's more for the quick hook up or I don't care young adult. For the price you can get better price, 3+star on Priceline, etc. Wk before, we stood at Marriott 4nights at $84a night king bed plus sofa sleeper and fits 2adults 4/5 kids w/ no problem very spacious room w/frig & Micro. Staff at Marriott was extremely nice to adults & children. Priceline is great way to book & express deal was secure and great. Definitely will book thru Priceline every time. Thank you for taking the time to review your stay. On behalf of our entire team, I would like to apologize for not exceeding your expectations. Your satisfaction is important to us and we will use your feedback to make improvements to ensure a better stay for future guests. If you are staying over the weekend, make sure you speak to the girl who works the front desk on the weekends! I think her name is Shelly or Michelle. She's a very pretty girl, very animated and Is absolutely adorable! she recommended several amazing places to eat, including sushi, as well as fun places to go on the island. Definitely would stay again. Thank you for reviewing your stay. I am happy to read that our team members were able to assist in making your stay with us comfortable and pleasant. We are lucky enough to have such a dedicate staff that works hard on creating a wonderful experience for our guests. Nice Best Western. Comfortable, SUPER high beds (be ready to jump). Very nice size bathroom. 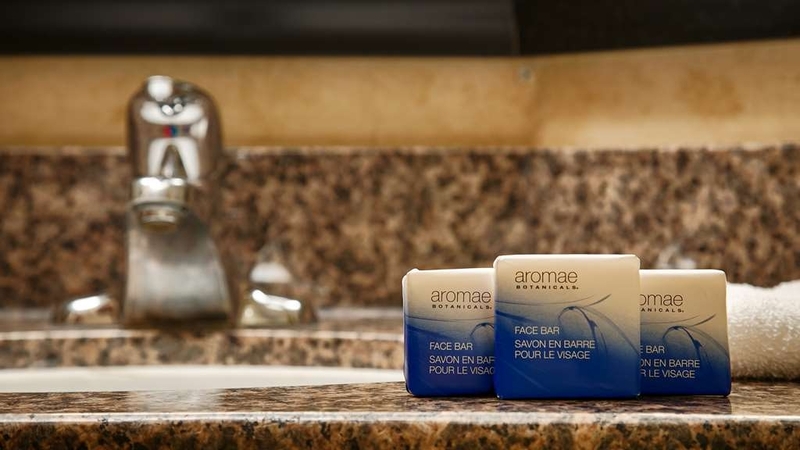 Decent quality complementary toiletries.They have smoking and non-smoking rooms, make sure you specify your preference when booking. Thank you for taking the time to review your stay with us. I'm happy our hotel could accommodate you and meet your needs. Please do not hesitate to stay with us again in the future if you ever find yourself in the area. "Thank you so MUCH for a WONDERFUL stay"
I spoke to Kathy three times before coming down from upstate NY. SHE WAS WONDERFUL. You have a pregnant supervisor.... OUT OF THIS WORLD HELPFUL!! Our trip was for a communion and needed to be at the church at 1pm. The staff made sure that we were settled and out the door on time. I couldn't ask for a better stay. TY TY TY!! Thank you for taking the time out to review your stay with our hotel. I am happy to hear that your stay was a pleasant one, and our staff met all your needs. We strive to make sure that each guest has an excellent stay. Hope to see you in the future. Railway/Transit System runs all night right outside the door, and bright safety lights in outdoor walkways shine in around the drapes all night. Very poor condition, outdated, and this is a motel, not a hotel! Majority of rooms are only accessible from the outside. Not Recommended. Thank you for taking the time to review your stay with us. I'm sorry to hear that your stay was not a pleasant one. Unfortunately the establishment is not a hotel it is considered a motel. I hope that one day in the future you will reconsider staying with us. From check in to departure - everything was fantastic. We used the pool and it was very clean. The continental breakfast was so good. The area was very clean and well maintained. I would highly recommend this hotel. Thank you for taking the time to review your stay at our hotel. I am so happy to hear that your stay was a pleasant one. We appreciate that you have acknowledged our efforts to provide a clean, comfortable, and hospitable experience. Very helpful during our stay in town for a funeral. Staff was amazing and breakfast was wonderful. I felt that they did everything they could to make our difficult time easier. Stay was quiet and location was close to everything we needed. Thank you for taking the time to review your stay. I am happy to hear that the staff here at the Best Western Bar Harbour Inn was about to meet your needs during your stay. I am sorry for your lose and hope that next time your are the area you will stay with us again. "This location is great near beach restaurants trains buses there is a nice gym and pool nice breakfast quaint appearanc"
Thank you for taking the time to review your stay with us. We are happy to hear that your stay with us was a pleasant one and hope you'll stay with us again in the future. "Satisfied, but with some issues." We appreciate that you took the time to leave a comprehensive review, highlighting not only the good but the bad. I am sorry to hear that some parts of the hotel you were not comfortable with. We strive here to make sure all of our guests have a pleasant stay. We have two types of rooms here standards with are on the exterior or suites on the interior. The suites have refrigerators, none of our rooms have microwaves. That is located in the lobby with 24 hour access too. Next time you are in the area for a extended period of time ask for one of the suites. It has more room for your family. Hope to see you in the future. Very nice hotel and staff. Quiet. Located walking distance to good food and shopping. Staff was super friendly and helpful. Upon check in, which was fast, I went to eat at Ciao Baby, right next door, per recommendation of front desk. Food was great! Simple breakfast in AM at hotel. Walked to TGI FRIDAYS for dinner and mall was right there. I really liked this place! Thank you for reviewing your stay with us. I am happy to read that our team members were able to assist in making your recent stay with us comfortable and pleasant. We are lucky to have such a dedicated team members that work hard on creating a wonderful experience for our guests. This was my third stay at this hotel this year. The common areas and room were clean and the bed was very comfortable. However, and this was not the fault of the hotel, I was unable to get a room with an inside corridor due to heavy booking. The probllem was that the room was located on the ground floor neat the front of the hotel and the entrance to the corridor leading to some rooms and the lobby area. The door to this corridor made a very loud screeching noise each tome it was opened, and since the hotel was quite crowded, this was quite often. Also, and again this is not the fault of the hotel, some guests were very loud while going upto the second floor rooms and entering or leaving the interior corridor. While the hotel itself was very nice, the room location and resulting noise level made this a less than perfect stay. .
"Hated to leave this hotel"
I checked in for six nights recently to have time to visit family & friends that I have not seen for years. An amazingly clean & quiet facility. I've never seen one this clean. I had a single king room on the second floor and though the hotel was full on one Saturday night I not even heard any doors close which often happens in the average hotel. Full bkfst selections including waffles, etc. open from 7 to 11 am. The TV in my room looked like a 48" HD set. 55 channels. Fridge & coffeemaker included. Very friendly room staff and in particular the desk staff. This is a family run hotel that they obviously take pride in. I look forward to staying there on my next visit in the Spring. I would recommend this hotel to anyone coming in for a weekend or a week or longer, Very helpful & courteous staff. Rooms were clean and well maintained. Service staff were very courteous and attentive to our needs. "No frills hotel, but they give 110% effort"
The front desk managers are terrific! One lady in particular (she was there most nights) was outstanding. Nothing was too much trouble. She went above and beyond the call of duty to help and assist. We were upgraded to a suite which was huge. It came with a fridge, desk and a large sofa seating area. It made our trip infinitely more comfortable. The beds were huge and very comfy. The bathroom was a good size. There is on'site laundry facilities, a swimming pool and business centre. The free breakfast was good. Scrambled eggs, sausage/bacon, make your own waffles, cereal, bagels, rolls, donuts and muffins were available daily.Free Hot drinks, milk and juice were available 24hrs from the machines too. There was also a microwave available for guests. There was an ice machine and several pay soda machines too. There was plenty of parking. The hotel was a "no frills" hotel, but they did as much as they could to make sure things are available to you and convenient. Very very highly recommended! We had just toured Fire Island and was looking for a place to stay. The gentleman at the front was very friendly. The room is clean, and comfortable. We had room 232 just around the back. It was quiet. The bedding top notch. Not Clean no trash pick up, bed to hard and high , bathroom sink and tub filled up with water. The bathroom door was so bad i would not put my bathrobe on the hook.,I understand this is a smoking room everyone smokes in the bathroom really need to be clean. I will not be coming back to stay. The people that work at Best Western are great, along with the cleanliness of the rooms. Breakfast is terrific and satisfies everyone, no matter their needs. Always accommodating and never a problem. I will always stay at this hotel when I am in New York. We are here for 4 nights. Room is comfortable, clean, fairly quiet to the busy street outside. The staff is very friendly. The only minor issue I had was a malfunctioning iron cord, and it was replaced within 5 minutes of telling the staff. The only addition that would have been nice is a microwave as we like to bring meals back, as opposed to eating in a restaurant. Motel is close to shopping, and restaurant, within walking distance. Breakfast selection is very good. Gorgeous roomy rooms. Fit the 5 of us with a pull out sofa. Wonderful staff who answered all my questions and were very helpful. Coffee bar open 24 hours. Breakfast was wonderful with a great selection. Will definitely stay here again. "Very nice motel in a great surrounding"
We were there with a group of 24 people and had 13 rooms booked. When we arrived the keycards etc were perfectly prepared, the ckeck inn process was done in only 3 minutes. Perfect! The rooms were comfortable and spacious, the pool is clean. Breakfast is good. All our expectations were fullfilled, partly exceeded. Thanks, we will be back next year. Nice hotel, friendly and courteous staff, plenty of restaurant / diner choices. Breakfast was very good, bed comfortable. Coffee and snacks (fruit) offered 24/7. All in all a good experience. Would not hesitate to go back. "Stayed at hotel overnight after visiting our son who lives close by." Upgraded us to a suite. Beautiful spacious room. My husband, myself and Grandson stayed in the room. Very courteous staff, loved that there was 24-hour coffee and refreshments in the lobby as well as a coffee maker and various coffees in the room. 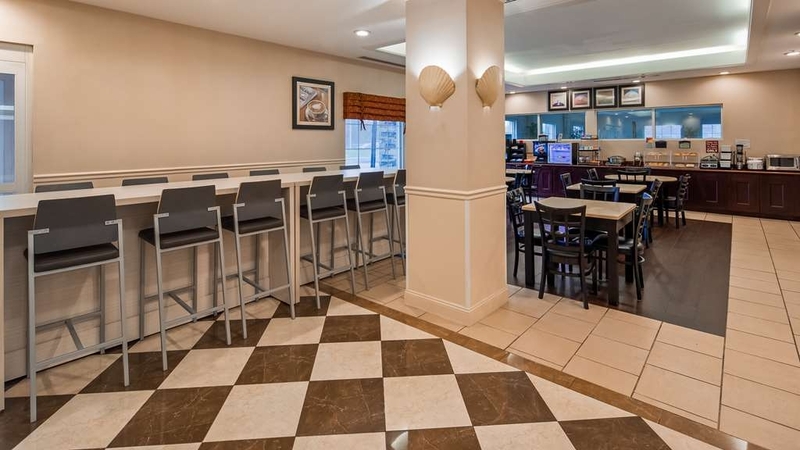 "Overall a good stay...but overall TOO SMALL"
"Best Western Bar Harbour Inn, Massapequa Park, NEW YORK"
Kathy at the front desk was wonderful. She went out of her way to make sure that we got everything we needed for our kids. This hotel is definitely kids/family friendly. This is the second year that we came back to stay here for our trip to Jones Beach. Great location and our kids love their swimming pool. It was a good stay, pillows and bed were not the most comfortable but for the price it was a good stay... walking distance to a couple of restaurants for dinner... free breakfast in the morning is a plus!!! Stayed one night 8/14/16, ( room 110) in town for a funeral. I should have known something was up when we checked in and the A/C was on 60 degrees. Carpet, sheets pillows were all damp. Room was musty and moldy smelling. I was just so tired from traveling, and emotionally drained, I did not complain until checkout. The front desk said they could not do anything for me. I just want to warn the next traveler. We had been put in a handicap room 103 and the floor was moldy and smelled musty. Was afraid to take a shower and put my feet on the floor, nothing a little bleach wont resolve. The breakfast was not bad and the swimming pool looked clean. "Lacking where it really counts." This review is written by a Travel Agent with 25years industry experience and 30+ years of travel under my belt, initial external appearance is great however these were the let downs 1- there were large holes in the carpet that look to be at least 12months old with no attempt to repair 2- our king sized bed linen consisted of a very old stretched out of shape with no elastic mattress protector that didn't even remotely stay on the mattress while we were in bed, it slid off then took the loose sheet that was our bed sheets with it exposing the mattress. 3- the king-sized mattress was absolutely covered in dark splotchy stains, dirt marks and god knows what other bacteria. Keeping ourselves protected from this was almost impossible with the inadequate bed linen used. 4- our room was full of small flying bugs similar to that of a fruit fly. 5- The picture frames hanging in the room were silver painted/laminate and were falling apart the silver was peeling off in large chunks from every corner. 6- two of the wall hanging light fittings were hanging off the wall with only one screw keeping them from crashing to the floor. And lastly 7- three attempts to contact reception staff both by phone and visiting the desk were met with absolutely no answer either phones weren't answered or there was absolutely nobody at the check in desk when visited. The only time we saw the desk being attended was Saturday lunch time when two women were sitting behind the desk reading magazines with their feet up on the desk relaxing like they were at home. We stayed here for 3 nights and by the second night I was tempted to drive back to Manhattan a day early as I'd been unable to get a decent night's sleep. I'd also like to note that although not essential items the rooms do not facilitate a bar fridge or a in room personal safe however they do offer security boxes at reception which didn't seem overly secure to us. We did read on TripAdvisor after checking in that multiple instances of theft/disappearing belongings have occurred in the past so I would recommend locks for suitcase and as we did take all valuables passports money etc with you when leaving for the day. We were in Massapequa Park for a family wedding. We brought husband's elderly mom too. At the last our sister (in-law) decided that her mom should stay with us. Luckily we were able to get a room for her for one of our nights. This is a centrally located hotel for our purposes and quite nice. Rooms and king beds are comfortable and clean. Staff friendly. Breakfast was good. Nothing fancy but eggs and sausage hot and good rolls/bagels/muffins. We were not disappointed with any part of our stay. We went to a wedding at Crest Hollow in Westbury which was an easy drive from our hotel. Very clean and the staff is friendly and efficient! Kathie (front desk) was very helpful when I called to make reservations. It was my pleasure to meet her in person the next evening. She is certainly an asset to this business. Joan was the front desk person when we checked in, and was very helpful with providing us directions. If we have a reason to return to this area again, we will certainly stay here ! ! ! Hotel is very clean and the staff is efficient and friendly. I was apprehensive about staying at this hotel but was pleasantly surprised to find it was clean and comfortable. The buffet breakfast in the morning and all day coffee, tea and fruit are a nice touch. I would stay here again next time we are in the area. I requested and was granted a late check-out time (12:00). By 10:30, I had most of my belongings out of the room, minus a large box that held 11 bottles of wine, which I needed help from my brother to carry down. He went to get it just after 11:00, while I was finishing breakfast in the lobby. The housekeeping staff was coming out of the room, having just finished cleaning it. My brother said we had a late check-out, and the staff said the front desk never informs them about late check-outs. So he asked about the big box of wine, and the staff said they didn't know what he was talking about, he must have the wrong room, etc. They started showing him a map of the rooms, which was clearly a way to distract him (presumably so that they could magically "find" the wine). Then they claimed to have called the front desk staff, who supposedly instructed them to have my brother come down and resolve it with them. He came downstairs to me and I told the front desk that a box of wine was missing from the room, which was cleaned already, despite a late check-out. (It seems that they were NOT already infomed of this by housekeeping staff.) They said they were looking into it, while my brother went back upstairs. He caught the housekeeping staff with the 11 bottles of wine, divided into separate bags, and they were frantically putting them back in the box. From their actions and their flat-out lies, they had obviously split up the wine amongst themselves. We made a complaint to the front desk, and although they were not rude about it, and agreed to inform the manager, they insisted that the wine was split between the bags because the box was too heavy for them to carry downstairs. I might have believed that, had the housekeeping staff immediately turned over the wine. But they lied and hid it, and I am disgusted. I am a local (was staying for a wedding) and I will never be staying here again, nor recommending it for out-of-town visitors. We stayed at this hotel several times before. This time we stayed in one the suites. The room was very well kept. The bathroom was clean. Beds were very comfortable. However, the mattress on the sofa bed was too thin and not as comfortable as the beds. Love the free hot breakfast! Belgian waffles,eggs,sausage, bagels, muffins etc. The staff was very friendly and accommodating.Will definitely stay again. our room was extremely spotless.an over abundance of towels.confortable beds.oversized pillows.we had a very enjoyable stay.very friendly staff and a great breakfast.soo much to choose from.my favorite place to stay when I visit family. "Could've been better...could've been worse... "
My family and extended family came to NY from out of state for a family reunion. We all booked rooms at this hotel and there were some positives and negatives to our stay. The positives were that the staff were friendly and personable for the most part. The breakfast was good and everyone of all ages was abet o find something that they could eat before our busy days started. The rooms were also clean which was great. Unfortunately there were some negatives to this hotel as well. When we checked in, we were informed that we were on the second floor outside. that wouldn't have been a problem except we were also informed there was no elevator to take and we would have to lug out suitcases up the stairs...strange!!! The pool was murky and dirty. When we inquired about it at the front desk we were told that "that is the way it was supposed to look." Finally, the walls to the rooms were paper thin which meant we heard all the comings and goings of people and their conversations...more than we have ever heard at any other hotel. We never did get a good nights sleep the neuter trip because of the noise. If you are going to stay here, make sure you get a room inside. "Our stay couldn't have been better"
My husband, son, daughter, grandson and I were visiting L.I. overnight to attend my nephew's Friday night wedding. It was the first night of the July 4th holiday weekend so finding reasonably priced accommodations for the evening was a little tricky. I found the Best Western Bar Harbour on TripAdvisor and it met all our needs. We were able to check in at 1pm so were able to get ready for the 4:30 church service at the hotel. The beds were comfortable, the staff was welcoming and professional, the room was clean, breakfast was good and the pool was lots of fun. No complaints what so ever about our night/morning at this hotel. Would definitely come back and would certainly recommend it. "Flying carpenter ants in room and other concerns"
This was my first time in this hotel. Based on the reviews on this site from other guests, that's what mainly influenced my decision in staying there. Checked in the room (located on 2nd floor outside), room was relatively clean. Later that night when we returned to the room, we started seeing flying carpenter ants. Literally, every minute or so, I would see one on the bed, then on the night stand, then on the walls, etc. I must have killed at least 10 within the time I was on the phone with the front desk. It was terrible. I was surprised to hear the general manager was on vacation until Tuesday, July 5th. How does a hotel not have a manager on duty on a holiday weekend? Not acceptable. The lady at the front desk did give us a different room (inside on second floor) which was much cleaner with no flying carpenter ants. I've never seen anything like it. Clearly the ants were coming from outside; there must have been a hole somewhere underneath the door or the wall or something. When I reported it to the front desk clerk, she said she's never heard of that kind of problem before. I find that hard to believe. Here are other concerns; the walkway outside on the second floor had some kind of juice or something that spilled. That spot was there when I checked in, in the afternoon, until later that evening. Could have been juice or something else, See pictures. I also observed a male walking around the property on the day we checked in. He asked if we dropped a small purse he found. I said no. I watched him as he walked towards the lobby. Later that evening, I noticed two women searching the ground for something. I asked what they were looking for. They said a purse. I told them a male picked it up and walked towards the lobby. The two women went inside towards the lobby. The next day I saw the women again and I asked if they retrieved the purse. They said no; the front desk didn't find anything, nothing was turned in. Then they asked if I could tell the front desk what I saw which I did. Turns out the male was the owner of the hotel and the purse was at the front desk all along. Seriously, the owner didn't communicate to the staff on duty or to ask them to forward the information to the staff that were working that evening he found a purse? He left no note or asked staff to leave a note so that everyone would know? And the customer had to return several times to retrieve it? Unacceptable. I will not return. Room clean and comfortable, breakfast had many choices. Overall an excellent value. Have stayed here many times. 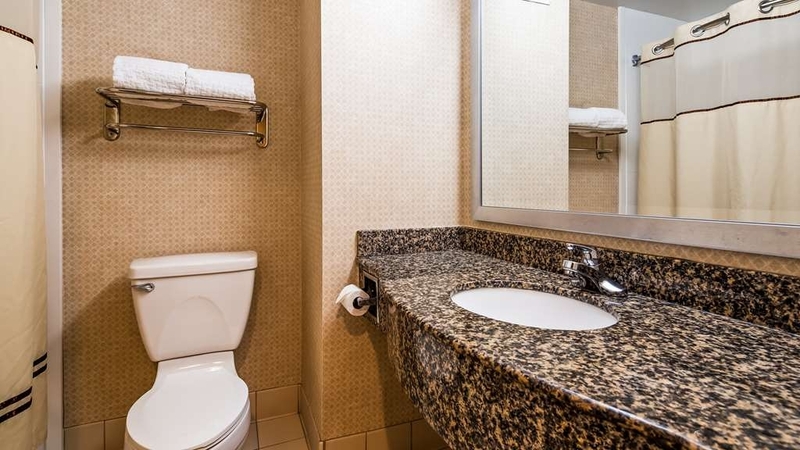 Hotel is close to LIRR and its is a easy commute to the city. Coming back in Oct. and will stay here again. "Great Price and Location - Friendly Staff"
We recently stayed at this hotel while attending a concert at Jones Beach. The lady at the front desk was very friendly and helpful. Greeted us with a smile, and gave us all sorts of information while checking in. We were only there one night, and she checked us in and out, so she is the only one we interacted with. The room itself was very clean and nice. The furnishings seemed to be updated. The bathroom was very nice, and had an exhaust fan which is nice to have. We were in one of the rooms on the outdoor corridor, which was fine. We had no issues with noise. I was only able to grab some bagels and coffee at the free continental breakfast, so can't comment more on that. The location was very convenient. It was on a busy road with lots of stores/restaurants/etc. Very convenient to get to Jones Beach. While we didn't utilize it, there was a train station very close that would take you into Manhattan. We checked online, and it looked like it was around 45-60 minutes to take the train from there into the city. Great area and very nice hotel. "A great place to stay for LI vacations." A fine hotel i a great location staffed by quality personnel.I have used this location for a number of years when visiting Long Island and have found the staff, location,amenities, surrounding area to be great. decent restaurants, shopping malls,movies,beaches and major roads are all nearby. Prices are high $150 for the kind of room I had received was told it's the very last room so I wouldn't have been able to change rooms Really dirty carpets / walls / bedding Smallest pillows in the world tried to get two more but they didn't have anymore to give out the shower head would shoot out water up and over the shower curtain all over your belonging that where in the bathroom The next day I ended up needing to stay another night and had asked if I could have a different room and when asked why I let them know a few of the things So the manager said come back in a few hours and they will have a better room The room was up graded ( bigger ) didn't need big just clean and as I walk into the very bad smelling room ( smoke ) it's Right on the main highway out front where I'm able to hear the people walking by and all the traffic too thanks for the wonderful up grade to what they would call a Suite ?? Very clean and great location. Nice continental free breakfast! I would recommend staying here. Very friendly reception area. I took the LIRR to NYC and the station is across the street. Also, drove to The Hamptons, and only took 1.5 hours. 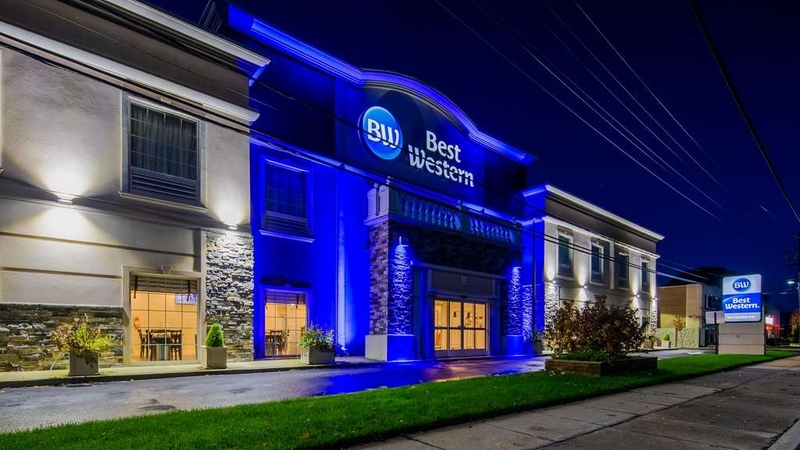 "Our Stay at Best Western Massapequa New YOrk"
This Best Western is our Home away from Home when we visit our children who live on Long Island. We have been coming to this hotel for 12 years and we are always satisfied and happy. The rooms are clean and comfortable. It is clean and equipped with enough shampoo and soap and towels without asking for more. If we need more of anything the housecleaning department is right there with what we need. The Hotel staff is friendly and accommodating. We would not think of staying any where else when we come to Long Island. "Clean Rooms with Fast Check-In"
I stayed one night on business, and the hotel rooms were very clean at this hotel. They offer a fast check-in, free breakfast in the AM along with free wifi. There is plenty of room for parking a car. The only downfall is that the hotel rooms on the main floor have outside access (similar to a motel),which can also make it slightly noisy if people are outside. However, I would stay here again. I have stayed at this hotel several times over the past few years and the service hase always excellent. The check in process is fast and the staff is very friendly. I have stayed in various rooms and all of them are good though I prefer the rooms with an inside corridor. Stayed four nights in a double queen non smoking suite. It's an older hotel but in very good to excellent condition. Neat, clean and well run. Breakfast was served very efficiently and the attendant took great pains to ensure that what she had was made available with frequent refills of fast moving items. We didn't use the pool or exercise room as we were too busy with relatives, but they both looked well kept and ready for use. When the time comes we'll stay there again. I had a business trip in the New York area and stayed at this Best Western Hotel. The caring staff made this extended trip quite enjoyable. They suggested great places to eat and listen to live music. The room was very clean, breakfast delightful and location ideal. Close to beaches, shopping and mass transit. No nearby alternatives. It's been there forever but recent updates are very good and welcome. Clean and comfortable room. Good breakfast. Some chairs were missing from dining tables. Very good restaurant next door Ciao Baby. No Golf Channel on the TV. Front desk ladies are the best. Maturity makes a huge difference! We needed a fairly inexpensive place to stay while we attended a family wedding. This hotel was a good choice. It was conveniently located between the wedding & reception and there were many eateries and shops within a short drive. The room was a bit small but the space was utilized very well, especially the bathroom. We did not know the area and were making a reservation solely on what we saw on-line. "Best Bang for the Buck on Long Island"
This hotel is an excellent choice with a very reasonable price. It is centrally located on Long Island, walking distance to Major Train hub, shopping and Restaurants. Safe area with clean rooms, great amenities (heated indoor pool very nice!) excellent breakfast and very friendly, helpful staff. The price was VERY Reasonable for the location. Other Hotels in area much higher prices for comparable rooms. The room was very nice, a huge fluffy king size bed and a pull out couch. The room is listed for 3 people. The couch was horrible. No cushioning at all and the mattress was thin and sagged. We had to request bedding for it. This couch should be upgraded if this is expected to be used as an extra bed. Breakfast was great. Very attentive staff continuously replenishing food. Awesome bagels and pastries. Nothing special about this motel. Rooms are worn, but clean. Most rooms have an musty odor. One smelled of dog. The walls are thin & you hear your neighbors on all sides. Cranking the A/C's fan & leave the bathroom fan & the TV on all night helps. One of the few places with HDTVs & HD cable. The breakfast was limited & many items were out by 7:30am. Everything, tables, counters, utensils, were all sticky. I stayed here for one night as I went to a gig at nearby Amityville. The hotel was clean with good sized rooms. I was surprised that the room I had did not have a safe to hold travel documents and spare cash, but it wasn't needed. This hotel does have a small gym and a small pool (not long enough to do proper lengths swimming) and plenty of parking. We were very satisfied with our stay at Bar Harbor BW. I hate to give it a good rating as it seems when I do that along with others, the rates get higher for the better ratings at the Best Westerns. We can't afford to stay very long because of the cost of the rooms. A true motel with outside entrance to each room. Security might be a concern. Friendly front desk staff. Average breakfast. Very affordable. Room was clean. bed was comfortable but a little worn out. Plenty of well lit parking. My room was quiet. Firstly, thank you for taking the time to write a review of your stay with us. I'm ecstatic to hear your stay with us was a delightful one and that your laptop was quickly handled. Our housekeeping staff constantly turns in items that are left behind by guests and we try our best to get in contact with the person as soon as possible to make the return process as quick and simple as can be. I hope to see you again in the future. Room was clean. Breakfast is well stocked. Had a king size bed so not much room; just the desk chair-no other place to sit. There is the hotel building and the parking lot-nothing else. If you get in late, you may not find a parking spot. I am not complaining; the location met our needs. This is the second time we have used this hotel. Both times the staff was especially kind and accommodating. They understood what was needed and did whatever it took to make it happen. The front desk staff was sensational. The rooms are clean and comfortable and the breakfast was delicious. This is our new home base whenever we come into NY. There are not many hotels in this area at a location that is so close to public transportation. If you need somewhere to stay in this area, your only other option is going to a motel. This hotel is great for the price, you get a nice breakfast in the morning and the rooms are clean and staff is professional and nice. My only issue is that I couldn't get the wifi to stay connected for very long, but that could just be my phone. Location convenient, rooms are updated and clean. Continental breakfast is typical but easy if you have kids. Family and friends were majority of guests for a couple nights. Staff friendly and accommodating. Indoor Pool was out of order during our stay. You can walk to local shopping to Kohl's, etc. Italian restaurant next door. at the room the door don't close good, so all ninth come cold from the door. I check in around 12AM the service at the front desk terrible.!! make mi waiting 25 minute before someone show up. I pay for 2 bed and I have only one, I ask for king side and give me queen. very bad. we are in 3 and sleeping in one queen bad. very bad. very bad. Last minute trip. Booked room that morning & got a clean, nice room with great service & staff that went out of their way to help us with our 2 small children. We originally picked this hotel because of their location & indoor pool but everything turned out to be a great experience . Breakfast was great & kids loved making their own fresh waffles & my wife liked the fresh fruit & selection. Pool & pool area was very clean & made for a great time for me & the boys while my wife attended to family business. Would definitely recommend to other people & stay again when were in the area. Also a lot of great restaurants within walking distance. Traffic could be a little noisy if you get a room along the highway. Stayed at this hotel between 4 Feb - 8 Feb as convenient for access to the LIRR & close to family. Provided with room 210, which was large, with a seating area & a large bed with comfortable pillows. Check in efficient. The good parts of this hotel: Wifi worked very well, had no problems especially with streaming. Breakfast was plentiful, waffles, bagels, yoghurts, sausages, cereal, eggs & bacon, which was gratefully received from the catering lady on the Friday of our stay. Westfield Sunrise Mall not far away. 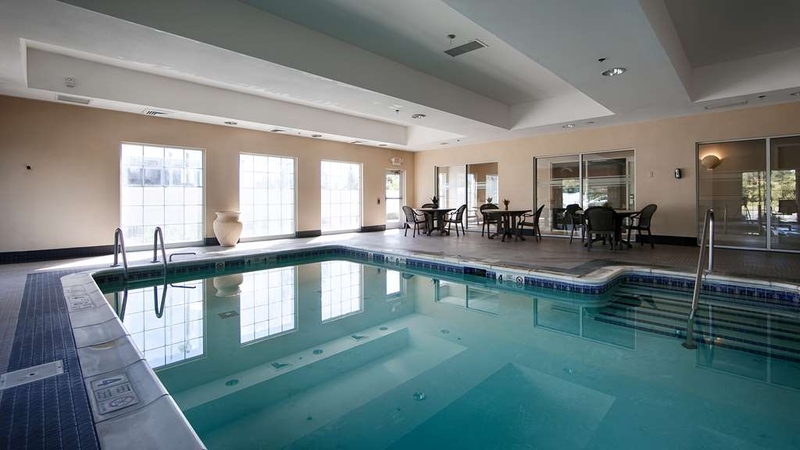 Indoor pool & gym, both used. One member on front desk very helpful. Now to the bad: Room not cleaned during stay. There's seems to be no checking on who comes in or goes out of the hotel, which leads onto my next bad point. LOOTED! Whilst we were having breakfast on the Friday, someone STOLE $260 out of my partner's purse. Mentioned it to the front desk, which was acknowledged with a cursory "I'm sorry", and when asking for the manager, conveniently not arriving at the hotel until after we've checked out!!!!!!!!!!! After our experience was soured by this response, I cannot recommend this hotel. "Caveat Emptor" Let the buyer beware comes to mind. I frequent this hotel every summer for about 40 days on business. The staff is warm, friendly and go out of their way to make sure their guests have a comfortable, relaxing stay. Kathy, Nicole, Joan at the front desk were the best!! Rooms are clean, Wifi is excellent. 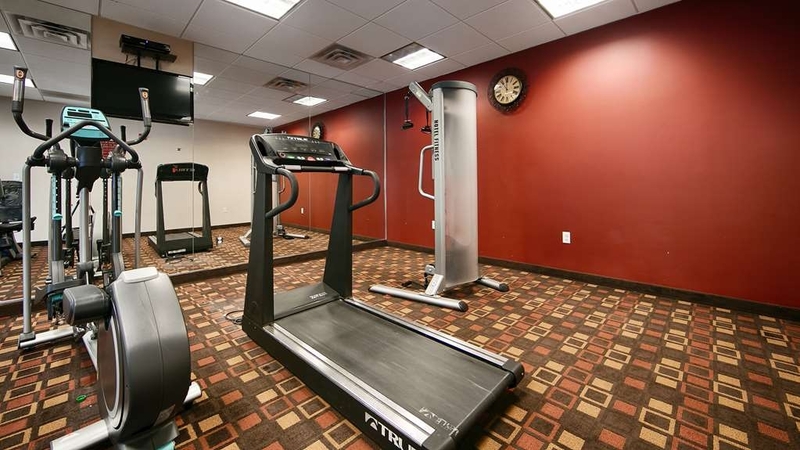 They have a small gym with televisions next to the lobby, an indoor pool and laundry facilities. a large array of breakfast including eggs, bacon, sausage, waffles, donuts, coffee, tea and fruit. One of my highlights when I'm away on business. Overall a great hotel with a fantastic staff to boot. I would not stay here again. The only reason I have not switched hotels is this one is conveniently located to my work and I'm here on an extended stay trip. I did however ask to switch rooms and nothing else was available but Cathy was very polite and helpful with everything I needed from her at the counter and so have the breakfast attendants as well. It's outside entrance and I am in the back corner of the building. It's very very noisy I hear the garbage truck in the middle of the night, people talking word for word in room next door, blaring music, etc. I also think that because the rooms are not inside they are not as closely monitored on what is actually going on in the hotel. Some guests seem to live here so it's more of a motel feel. The rooms are very small and the bedding is no longer white but a dingy yellow with holes in the sheets. The rooms have no fridge and the windows are very drafty. Not worth the price we are paying to stay here with all the complaints! Thank you for writing a review of your stay with us. I'm sorry to hear your stay was an unpleasant one. Our staff tries their best to meet the needs of every guest. Our property is under 24 hour surveillance with cameras covering the property with our staff monitoring to ensure guest safety. Our sheets are an ivory color but I'm very disappointed to hear your encountered a hole. We do not wash our sheets on site but instead send them out to a company for cleaning and pressing and the industrial machinery can do some damage so our housekeeping staff usually keeps an eye out for damage. I'm sorry to hear your bed was made with a blemished sheet. We sadly do not keep refrigerators in all of our rooms but will gladly store food or medication upon request of the guest in our staff-accessible refrigerator in our kitchen. And our property is in fact a motel and we have both interior and exterior entranced rooms. We are remolded and constantly making updates to make the stay of every guest as pleasant as possible. I truly am sorry your stay with us left such an unsavory taste in your mouth but we strive to impress so if ever you find yourself in our area again I hope you'll give us a second chance. "If you like scrambled eggs and sausage for breakfastevery day, this is the place." If you like scrambled eggs and sausage for breakfast every day, this is the place. No changes here. Clean as expected and located close to where I needed to be. No refrigerator or microwave in the room like there is in Days Inn at the next town. Thank you for taking the time to review your stay with us. We're pleased to hear that your stay with was a pleasant one. I'm sorry to say we do not keep a refrigerator in all of our rooms and you won't find a microwave outside of our breakfast area but it is available 24 hours a day for guest use and our staff is more than happy to store medication or food overnight in the refrigerator in our kitchen that has limited access to employees only. Thank you again and we hope to see you again when you find yourself in the area. "Best stay if you are hitting the City"
My family loves NYC. This year we decided to spend Christmas in the city. after much research, we decided on this hotel as it was close to multiple restaurants, close to the LIRR station and had an indoor heated pool. Rooms were up to date and comfortable. Staff was very friendly. Breakfast was always fresh with a great variety of local bagels and doughnuts along with eggs, sausage, muffins, coffee and juice machines and a waffle maker. If you want to stay in NY on a budget and be within a reasonable distance from the city. This is a great place to stay. Thank you so much for taking the time to write a review of your stay with us and I'm delighted to hear that it was such a pleasant one. We pride ourselves in being a very convenient property for our guests; between our closeness to our busy main street to the Massapequa Park train station being a short half of a mile down the road to us, there is always something around to enjoy. Again, thank you for writing us and please, do stay with us again. "Terrible, will not stay again!" I was very disappointed with this hotel. The door was not sealed so cold, December air kept our room very cold. The wallpaper was peeling from the wall and ceiling near the door. My husband, kids and I all got sick from eating the breakfast. Will never stay there again! Thank you for taking the time to review your stay with us. I'm sorry to hear you and your family found yourselves ill after your stay here. This is the first I've ever heard of a guest getting sick, both during the time you spent with us and during the rest of the year. I'm terribly sorry that your stay with us wasn't the most positive one but do give us a second chance to impress you if you ever find yourself in the area again. Was very happy with our stay,all the staff were very friendly and attended to our needs and requests, the breakfast was good the location was very good, the room was clean and neat each day . Would recommend this hotel to anyone looking for a place to stay with great value. Thank you for writing a review of your stay with us. I'm happy to hear your stay with us over the holiday was a joyful one and hope to see you again in the new year. I just love to come and visit this places; very friendly staff, everything it's super clean, definitely they work hard to keep high standards, and off course I will visit once, and off course I going to visit over and over. I think it's located in a very convenient spot, just on the right hand of one of the main highway's of Long Island. Plenty parking, safe, clean and luminous. I was to thank you for taking the time to write of your stay with us. It's always uplifting to read about the satisfied stay our guests have had with us. Please do not hesitate to stay with us again. "our stay at New York"
Our stay at the Bar Harbor Inn in Massapequa Park, NY was awesome. Everyone was very helpful and concerned about our visit and helped us with rental cars, transport to JFK at four in the morning and even finding a lost USB drive and holding it for my sister to pick up. The room was very clean and comfortable and the housekeeping was great. The breakfast room was clean and had a hot breakfast every day. Eggs, sausage, waffles, bread, and doughnuts and more. Thank you for writing us about your recent stay at our hotel. We are so happy that your stay was an enjoyable one. Our staff truly does try to exceed expectations and do any and everything within their power to help our guests. Thank you again for your review and do not hesitate to stay with us again. "Close to a everything we want"
We have stayed at this Best Western numerous times in the past and it continues to be an excellent place to stay. Clean comfortable rooms. Breakfast is a bit smaller than other Best Westerns we've stayed at but this one is always fresh and quite adequate. Eggs, sausage, breads, rolls etc. Constantly be refreshed. The staff is quite friendly. We will definitely be back. It's a Best Western, so you know what you are getting. Nothing luxurious, but very safe and satisfying accommodations. No reak high end offerings in the area. The rooms were clean and the bathrooms were nice. Quiet stay with great parking access. I stay here almost every trip to Long Island for work. Hotel is on the way to our warehouse. It is Convenient, Clean and comfortable. Rates are par with the area but the convenience and service win over. Great folks too. "Totally fine place to stay"
We were in town for a big family gathering so there was no room at my family's house. I'd passed this place by so many times, but never stayed. I know it was recently remodeled and it shows. Everything felt very new, and all was clean and tidy. The room was very quiet despite the outside facing doors, and the free breakfast was fine for what it was. I'd stay here again, though the rate seemed a tad high for the location and amenities provided. My family and I had reservations to stay at this hotel one night while renovations were being done on our home nearby. After check in we went to our room, however it smelled horribly of chemicals (either bug spray or from the indoor pool). The manager on duty was very kind and gave us a new room, however upon going into that room it reeked of smoke and I unfortunately have asthma. We decided not to stay at the hotel and the manager on duty gave us a number to call to see if we could get a credit for the stay but we unfortunately forgot to follow up. The staff was very nice and the hotel was average from the looks, but the smell was too much for us. most of my business trip to Long Island NY I've always looked forward to stay in you your hotel. Although it is a smoking room I do enjoyed my stay at this hotel it really differed from other hotel I've stayed in the area when it comes to clean and friendly staff. "Clean and in a good neighborhood"
The hotel is in a really good area of town, close to some good restaurants and there is a mall not too far away. It is on Sunrise Hwy so there is some traffic noise but not too bad. The picture makes it look like it is an " inside" hotel, when in fact most of the rooms in the back are motel style with the doors opening up to the outside. That being said, we stayed in one of the back rooms and it was very nice. Very clean, comfortable beds, and really nice bathrooms. Good wifi reception and a great breakfast with eggs, sausage, and a waffle maker. I would definitely stay here again and recommend to others. A great location with a staff dedicated to providing great service. Reluctant to profile this facility for fear that rooms may not be available when needed. I'm not certain what else to say in support of this facility that has not been said above and in the items checked in the survey. A great Long Island facility at a reasonable price. I have stayed here several times and the experience is always the same. From reservation to check-in to check-out every one of the staff is friendly and accommodating. EVER ONE of them. Don't forget to leave a tip for the cleaning staff and the lady at breakfast.... They all want you to be satisfied. This place makes it easy. P.S. This hotel accommodates smokers so if you don't smoke, ask for room in the front building. This visit was the third time we stayed at this hotel. It is always an enjoyable experience. The facilities are well maintained, the room is great, parking is convenient, and the staff is very friendly and helpful.